In 1993, the North Carolina Legislature enacted General Statute G.S. §143-215.22I as part of An Act to Regulate Interbasin Transfers (Session Law 1993-348). This law regulated large surface water transfers between river basins by requiring a certificate from the Environmental Management Commission (EMC). In general, a transfer certificate is required for a new transfer of 2 million gallons per day (MGD) or more. Certificates are not required for facilities that existed or were under construction prior to July 1, 1993, up to the full capacity of that facility to transfer water, regardless of the transfer amount. 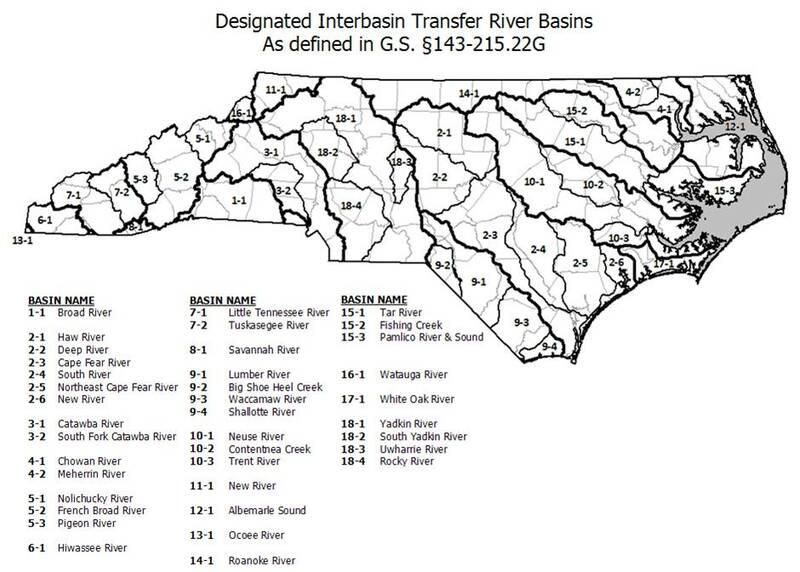 If you have any questions regarding interbasin transfer, please contact Kim Nimmer at kim.nimmer@ncdenr.gov or (919) 707-9019. If you would like to be included on the Division of Water Resource's mailing list to receive information relating to interbasin transfers and the EMC's Water Allocation Committee, please sign up using the following link: http://lists.ncmail.net/mailman/listinfo/wac. The following water systems have current, pending actions relating to interbasin transfer. The following water systems are authorized, through either a certificate or their grandfathered capacity, to transfer over 2MGD of surface water.